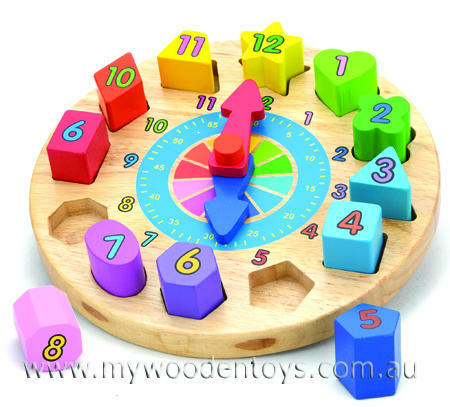 Block Sorting Wooden Round Clock is a beautifully made rubber wood toy that will provide lots of learning fun for your little one. With twelve multi-shaped numbered blocks in bright happy colors this will become a quick favorite. The clocks hands move in in clockwise and anti clockwise directions and minute increments are also printed on the clocks face. The clock also has 2 round wooden balls attached to the back so it is propped forward toward the user. We like this because: "very well made beautifully smooth rubberwood."